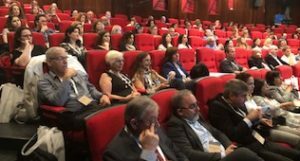 On Wednesday 9 May 2018 the Israeli Society of Cosmetic Chemists (ISCC) held a joint symposium with the IFSCC, the first ever IFSCC event in Israel. ISCC President Dr Arie (Yoki) Giniger and Ms Yael Noga and Dr Nava Dayan organised the day-long ‘Innovation in Skin Care – from Science to Market’ seminar. Speakers were: Ms Amy Wyatt (innovating for the luxury market), Dr. Nava Dayan IFSCC International Speaker (cosmetic product development – a landscape of limitations and opportunities), Prof Francesca Levi-Schaffer (mast cell activation in skin reactions: not only allergies), Prof Dr Juergen Lademann (topical delivery of cosmetic products with nanoparticles: science fiction or reality), Prof Karl Skorecki (population genetics and evolutionary biology of human skin color variation), Dr Frederick Leroy (non-invasiveimaging of the skin: seeing the invisible), Dr Ze’evi Ma’or (New findings in Dead Sea Minerals – skin effects and their translation to treatment and products), Dr Shlomo Krispin (phytoene and phytofluene: instant, optical and long term skin beauty benefits), and Prof Vania Leite (neuroscience: a new tool linking cosmetics to wellness). Over 100 current and potential ISCC Members attended the seaside conference facility north of Tel Aviv. Prior to this event, the IFSCC Praesidium held their annual Spring Praesidium Meeting in Israel. Dr Peter Kang, President of the IFSCC, chose this venue as the location of the 2018 spring meeting to support the efforts of the ISCC. Many thanks to Nava for arranging the scientific programme and to Yoki and Yael for making both events a success. Shalom!